Time and tide wait for no man. Unfortunately not so for the Dow Clock that overlooks the four sides of Franconia’s historical Dow Academy. With the clock tower badly in need of repair and the clock mechanism itself not functional, the town’s timepiece that chimed the hours with unbroken rhythm for so many years has been sitting silent. Happily, thanks to a dedicated group of caring Franconia folks, that condition is being remedied. According to Hamilton Child in the Gazetteer of Grafton County, Franconia was home to 550 people in 1880. In 1885, the town had five school districts and five common schools, with 87 children attending school and eight of those pursuing higher grades. Serving the population were 3 churches, 2 stores, 5 hotels and summer boardinghouses, a sawmill and bobbin shop, and about 40 dwellings. It also boasted a fine private academy, warmed by steam heat and supplied by every modern convenience available at the time. The academy’s benefactor was Moses Dow, publisher of Waverly Magazine in Boston. Dow presented the trustees of the academy with a check for $15,000 dedicated to building the new school. It was his intention to promote the higher education of young men and women and to afford a thorough preparation for college for those who desired it. Later, at his death, his will stipulated that a trust fund be established in the amount of $60,000 for the purpose of maintaining the academy. Construction for the building began in 1884, at the corner of the current Church and Academy Streets, and it was completed in 1885. By 1898, enrollment included 125 students of all ages, plus 25 out-of-town boarding students. In 1902, Dow Academy was leveled by a catastrophic fire. The following year, it was rebuilt. At that time, an agreement between the Dow trustees and the Franconia School Board allowed all district children, grades 1-12, to attend, with Franconia taxes contributing part of the annual teaching cost and the town contributing $4,500 towards rebuilding the structure. Gradually, Dow Academy became a town school with its operation paid from the town budget and no tuition required for Franconia children. Unlike the original building’s pointed steeple, the new Dow Academy was crowned with a domed cupola to house a new clock and bell. The clock displayed four faces, one facing each point of the compass. Colonel Charles H. Greenleaf, then owner of the Profile House in Franconia Notch and a New Hampshire Congressman, and later the donor of the Abbie Greenleaf Library, gifted the Dow clock to the town. The clock was made by the E. Howard Company of Boston. 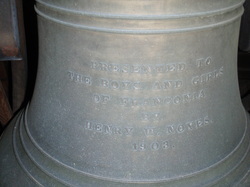 Henry W. Noyes donated the bell attached to the clock, deeding the bell to the children of Franconia. The inscription on the bell reads, “Presented to the boys and girls of Franconia by Henry W. Noyes, 1903.” Noyes stipulated that the children were to be allowed to ring the bell on special occasions. as the town’s combined primary and high school educational institution. After 1958, Dow Academy ownership changed hands several times. In 1983, the building was repurposed as a condominium complex. Taylor did this work for about 10 years. During his stewardship, the Dow clock was vandalized and the clock hands on one of the faces were destroyed. Mark Champagne, then a 17-year-old student at Profile School, fashioned new hands for the clock, and he and Taylor installed them with an audience of townspeople watching from up on the roof and down on the ground. The task of maintenance was later taken over by Don Eastman. In 1982, Dow Academy, with its iconic clock and steeple, was placed on the National Historic Register. In more recent years, aging and weather have continued to take a toll on the clock and its lighted tower. Finally the clock stopped, the bell no longer chimed, the lights went dark, and the tower structure began its decline. In 2013, voters at the Franconia Town Meeting approved $12,464 towards the cost of repairing the roof on the Dow Academy clock tower, splitting the $24,928 cost with the Dow Academy Condominium Association. No extra monies for the clock and clock tower were appropriated at that time. At the 2014 town meeting, voters approved another $10,000 to repair the clock works so this town landmark could resume its role as a functioning timepiece. Donn Lathrop of Lyndon Center, VT, was contracted to undertake the work during in the summer of 2014. As he worked, Lathrop discovered a problem with the weights that control the clock. At his suggestion, the unstable weights are being replaced with a new electric mechanism that will automatically maintain the correct time, through power outages and seasonal time changes, and also drive the timely ringing of the bell. For historical purposes, the stone-weighted boxes on the rope pulley will remain in place. Concurrently, a group of private townspeople undertook the task of fundraising, locally and online, with the goal of restoring the clock tower to its original condition. The anticipated cost of restoration is $50,000. After compiling a list of suitable candidates in the tower restoration business and receiving job estimates from them, Phil D’Avanza will be contracted to undertake the job of steeplejack. The committee also has applied for a $10,000 NH Moose Plate grant to help offset the restoration expenses. If the grant is approved, this money will be added to the funds already collected through the fundraising effort. It is anticipated that the tower restoration job will begin by the late summer of 2014. Any funds collected above the contracted amount for the work will be placed into an ongoing maintenance fund for the Dow clock. Town of Franconia-Dow Clock, PO Box 900, Franconia, NH 03580. These funds will be deposited to an account at the Connecticut River Bank specially designated as a Dow Clock fund. The Icon on Old Home Day.